MaximumSoft Corp. today announced release of its new product iDreamPublisher. This Dreamweaver extension publishes sites directly to iPad / iPhone and allows web developers show their work anytime and anywhere, even when Internet connection is not available. 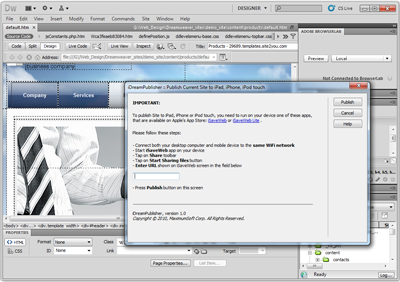 Use iDreamPublisher to publish sites directly from Dreamweaver to iPad / iPhone / iPod touch over WiFi connection, and show them offline, anytime, anywhere. MaximumSoft Corp. today announced release of its new product iDreamPublisher. 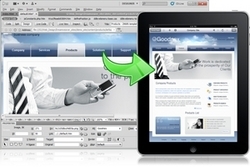 This Dreamweaver extension publishes sites directly to Apple® iPad / iPhone / iPod touch and allows web developers show their work anytime and anywhere, even when Internet connection is not available. 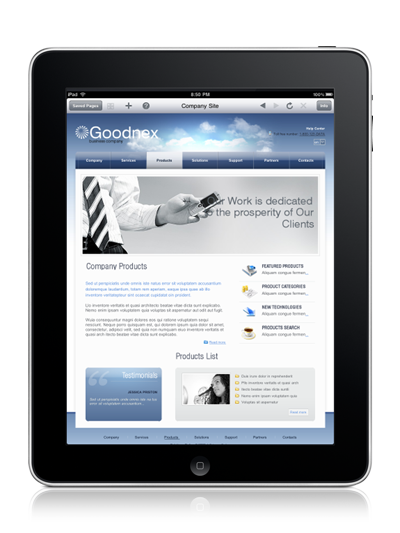 With iDreamPublisher web developers can reach their clients and impress them with site preview on such popular mobile devices as iPad, iPhone and iPod touch. Web site developers also need iSaveWeb (paid) or iSaveWeb Lite (free) app from Apple's App Store. In addition to iDreamPublisher, MaximumSoft Corp. provides a wide range of WebCopier™ and WebCopier Pro™ products that help transfer corporate intranet contents to staff desktops, notebooks, netbooks, iPhones and iPads. Analyze websites structure and find broken links. WebCopier products are available on Windows, Mac OS X, Linux platforms, as well as on Windows Mobile devices.